It was springtime 1990 when Pappagallo’s Satellite Beach took its first catering order. Honestly I think it might have been our second day that we got our first party order for 10 extra large pizza for an office party. I confess it was for a friend but an order is an order and 29 years later we are still customizing catering orders to the needs of our guests. Looking back I wish I would have kept better records of all the birthdays, weddings graduations and sadly even celebrations of life, we have had the privilege of catering. Pappagallos.com has a basic listing of our most popular catering trays but we can offer any type of meal for your occasion, from subs to shrimp is a pretty accurate definition of what we can offer. If you look at our catering menu you will expect to see lasagna, baked ziti, 2 foot party subs and we definitely can accommodate those needs but if you need something a little more “out of the box” then give us a call at 321-773-7272 and we can custom craft your event to your specific needs. Some of the non traditional items we have done for our catering guests include, breakfast burritos. We have done pulled pork and pulled beef, on occasion we have done events that wanted lighter options so we made garden wraps with grilled chicken and fresh cut fruit salad. Beef tips and chicken Marsala served with wild rice has come out of our kitchen on numerous occasions. At the risk of sounding a little overconfident, we can make the catering dish of your choice even if it’s not a traditional Italian menu. Our standard catering menu offers trays that serve either 8-10 for half tray and the full size tray that feeds 16-20. These trays come with tossed salad and our homemade garlic rolls, of course you can always upgrade the salad to a ceasar salad or an antipasto. for a slight charge. Pappagallo’s Satellite Beach has also added several pieces of equipment to our catering operation so we can handle larger orders and deliver them to events further away from our store than we could in 1990. Pappagallo’s Satellite Beach added a full size panel van a few years ago, the “pie wagon” is equipped with several insulated cabinets to keep the hot foods hot during transit and Pappagallo’s Satellite Beach also added a heating cabinet that can be powered by a propane generator to keep food hot on site for several hours. Pappagallo’s pie wagon can be seen around town daily or parked outside Pappagallo’s restaurant waiting for our next catering assignment. The heating cabinets have proven themselves during several events such as a local food and wine festival this past fall. The event was only a few miles away but Pappagallo’s Satellite Beach was asked to have food samples of 750 servings. The amount of food we prepared was challenging enough but without the generator powered heating cabinets this event would have been an impossible task for us. Pappagallo’s pie wagon has been all over the space coast delivering catering for every occasion from pizza parties for local schools to wedding venues all over town. Pappagallo’s Satellite Beach has come a long way in the catering game since that first 10 pizza order back in 1990. We really enjoy doing catering because it’s always a chance to be part of the party. The staff at Pappagallo’s Satellite Beach looks forward to our catering events. It gives us all a chance to do something that is a break of the daily routine. Over the years we at Pappagallo’s Satellite Beach have become almost known as the “last minute” catering company. We of course ask for 24 hours notice but life doesn’t always give any of us that much time and the staff at Pappagallo’s Satellite Beach always does our best to provide a solution to those last minute catering needs. Another advantage when you call Pappagallo’s Satellite Beach is the flexibility we offer for events that don’t always fall into our normal hours of operation. Pappagallo’s Satellite Beachopens at 11 am every day and closes at 9:30 pm except for Friday and Saturday when we stay open until 10:00pm. As we mentioned earlier, a local church asked us to provide breakfast burritos for their parishioners but the order needed to be delivered to the church by 8:45 am. Not only did we do breakfast burritos which is not on our regular menu, the order needed to be delivered 2 hours before we usually open. At Pappagallo’s Satellite Beach our focus is always on quality and freshness first. Sometimes that calls for early mornings our late nights to make sure that our products are delivered as fresh as possible. 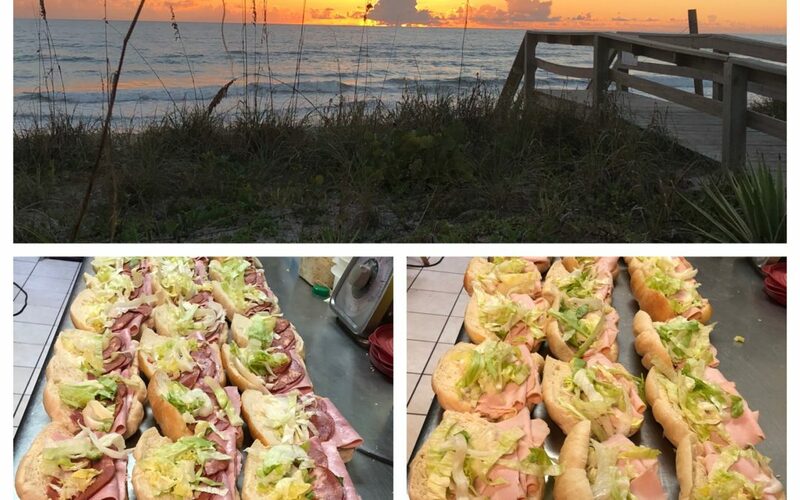 The local high school had asked Pappagallo’s Satellite Beach to provide subs for the team as the away game meal. The first few away games fit right into our regular hours of operation, then came that last away game, the game that was hours away and the team had to leave by 8 am for there Friday night game. As most of our guests already know, fresh homemade bread is a huge part of the Pappagallo’s Satellite Beach experience, and fresh bread takes time. Therein lies the dilemma, if you’re reading this you probably can guess that I personally can’t stand stale bread especially when it’s for a special occasion like a wedding a Christmas party or in this case a football game. So if you need a party to be pick up an order at 8 am for 65 subs for a football team that means we need to start cooking bread at 3:30 am. Time to get all the subs rolls to rise, bake, cool down and then make them into subs, finally wrapping each sub individually. Pappagallo’s Satellite Beach is the call you need to make. Our catering department doesn’t always get up early, sometimes we stay up late too. Last year we were asked to provide pizzas for Project graduation. We of course were really excited to help out such a great cause. There were a few issues with this request first it was a Friday night, which is our busiest night. Second Pappagallo’s Satellite Beach closes at 10:00pm. Friday is usually a 14-16 hour day for us, and project graduation didn’t start till midnight. The organizers graciously offered to pick up the pizzas at 10:00 pm, as our last order of the night. Here’s when the whole “fresh” idea comes into play… I did appreciate the offer to pick up the pizzas at 10:00pm but I couldn’t in good conscience let fresh graduates eat pizza that is hours old, that’s just not quality and it certainly isn’t Pappagallo’s. In closing if you’re looking for a caterer for your next event please take a look at our website for a starting point of what we can do to make your event memorable. If you have menu choices that don’t appear on our menu please give us a call and we can customize a menu to suit your needs and budget.